I have great respect for people like David Anderson, because he has done the research and the work, and put himself out on behalf of others, and so I’m delighted to carry his article in our newsletter. In 2014, David Anderson says that Vets Now, an out-of-hours veterinary franchise, overcharged him and over-treated and overdosed his dog. All complaints to the Royal College of Veterinary Surgeons (RCVS) and enquiries over fees were rejected. As a result he started the Facebook group Vetsnow complaints. David says, “The page elicited many stories and comments from pet owners who felt they had suffered much more than I at the hands of Vets Now. All of us had followed the British Veterinary Association (BVA) and the Royal College of Veterinary Surgeons (RCVS) advice to raise issues with the company, and not one had received anything other than stock excuses and platitudes. In July 2017 the RCVS held its annual day, an impressive affair with various members wearing pretty gowns and hats. It was a day of smug self-congratulation. They gave themselves hundreds of awards; they spoke of the success of the scheme to allow vets, who are not doctors, to call themselves doctors because Australian vets can. They spoke of how much they wanted to avoid external regulation and the importance of change. Few organisations need these things more. However they made absolutely no mention of the hundreds of complaints that are dismissed with no further action every year. Since 1966, an important date, the RCVS have received, by their own admission, about a thousand complaints from clients each year. In fairness I make it less, on average about 800 , but as the RCVS rejects nearly all of them anyway, 200 loved pets make little difference. Until very recently on the RCVS website you would find a page that proudly proclaimed that, “despite the annual number of complaints, because of our robust investigation procedures, only 1% ever reaches a disciplinary stage.” This means that the remaining 99% are dismissed with no further meaningful action. The RCVS has removed the page and now says that around 80% of complaints have not progressed beyond Stage One of the concerns process. They also say that there are two more stages which increase this percentage further…. to 99% , which is what I said. So the governing body of veterinary surgeons, the much revered Royal College that loudly proclaims how it strives to set standards for the benefit of the profession and its clients, has steadfastly dismissed for the past, now 51 years, in the region of 45,000 complaints. These complaints are about standards of care, extortionate fees, and more. How can it be that the interests of pet owners are treated with such uncaring contempt? Well, the RCVS blames the jurisdiction of the Veterinary Surgeons Act of 1966, which they conveniently insist constrains their actions. This Act stipulates that a vet can only be disciplined if they are guilty of serious professional misconduct for which they can be struck off. There is no other avenue of complaint. Not surprisingly this very high level of malpractice is very rarely reached, especially as only vets can judge a vet and the RCVS themselves undertake the investigations. The RCVS knows full well that there are literally thousands of genuine complaints from clients who only want some justice for poor care and/or excessive fees, but they have simply chosen to bemoan and bewail that this ‘antiquated’ Act has, for 50 years, completely tied their hands. Within this group (of 800 complaints per year) there are potential cases of negligence as well as consumer and service disputes, neither of which the RCVS has power to resolve as they don’t cross the high threshold of misconduct – so says the Registrar of the RCVS. Put very simply they are perfectly happy with things as they are as their role in life is to protect their overblown Royal status and above all the reputation of their paying members. Frankly the interests of unhappy clients are of no importance. Although the RCVS perpetuates the nonsense that the only sanction that a vet can receive is to be struck off (a vanishingly small likelihood as even those few who are disciplined are rarely deregistered), not many aggrieved clients actually want a vet to lose their livelihood and the Act does not, and never has, prevented the introduction of a much simpler and quicker second tier complaint process to allow the hundreds of unhappy clients a degree of justice. The fact is that the RCVS has never made any effort to set up such a process or to introduce an amendment to the Veterinary Surgeon’s Act. As a classic example of how little the RCVS cares about the interests of clients, it’s worth noting their refusal to implement their own regulation about fees. In the Guardian online article (April 2016: Are Vets´ Bills Making You As Sick As a Dog?) reporters were told by the RCVS that they do not regulate fees , but were told that there exists a regulation that says that if a vet charges excessive fees this is considered to be serious professional misconduct worthy of disciplinary action. The reporters were not told, however, that this regulation had only ever been applied once in 50 years (and that the offender was acquitted). The Disciplinary Panel considered that mark-ups on medication of 200% to 300% were disgraceful. Take a quick look at a bill from a large infamous out of hours company and Google the prices of medications and blood kits etc. Disgraceful is not in it. The RCVS refuses to apply this regulation to this company’s CEO, who is famously on record as saying, “I am not in this business to make money”. This Government Committee required the RCVS to work with Defra to change this and to provide a White Paper to amend the 1966 Act. The RCVS and Defra combined did absolutely nothing until 2013 and 4000 complaints later, when an LRO was implemented which did nothing more than tinker with the Committee membership in order to modernise and speed up , but not change, the Disciplinary process that rejects 99% of cases. According to the RCVS figures, nothing whatever has changed. No speed-up nor reduction in complaints, nor any increased number being disciplined, nor any sensible second-tier complaint process. So in 2015, and 1600 more complaints later, the pressure on them was such that they had to do something – and that something was two ludicrous trial Alternative Dispute Resolution Schemes. The first of these came into play when the RCVS had rejected, as they do, the client’s complaint and the matter was then referred to the scheme. This scheme was entirely voluntary, with no sanction nor criticism if the vet chose not to participate. So 88% did exactly that: they didn’t participate. Thankfully this Scheme was cancelled, but only after it had been extended for six months and more vets simply refused to participate. This Scheme then gave way to another that is even worse. The RCVS now ‘signposts’ complaints straight to the newly formed Veterinary Client Mediation Service (the VCMS) – a mediation service outside the RCVS. As a consequence these complaints no longer appear in the RCVS statistics. This scheme is also voluntary and a goodly percentage of vets simply refuse to face their complainants. If a complaint is made directly to the RCVS it will be (their word) ‘triaged’, but most likely the RCVS will try to hive it off to the VCMS. However, the very most an aggrieved client might expect by way of redress would be an apology or a contribution to a charity, but only as long as the traumatised or grieving pet owner stops posting nasty things on Facebook. At long last, as a consequence of the ongoing pressure from many consumers and action groups, the RCVS has come to the realisation that they are losing public trust and say they intend to do something about it by setting up a working party to consider whether new legislation to regulate the profession may be appropriate. It is my guess that they will change as little as they can and take a long time doing it. We can safely assume that one member of the panel will be reluctant to change anything. This person is a senior manager in the RCVS and also a senior manager of the out of hours practice that benefits so much from the fact that the RCVS allows them to operate monopolies in large geographical areas (a matter in the CMA’s “pipeline”) and to charge as much as they please. Any suggestion of a special relationship between the RCVS and this company will be vehemently denied. It is not easy to place much faith in an organisation that does not understand that declaring an interest does not actually remove it. Mr May, who chairs the working party, observes that “The UK leaving the EU will necessitate some changes to the Veterinary Surgeons Act as it currently exists so this feels like an opportune moment to carry out a wholesale review of the legislative basis for regulation of the veterinary profession in the UK”. Clearly nowhere on the 50 year journey to 45,000 complaints was any other time considered opportune. The RCVS are always polite and appear helpful but they are past masters at presenting vested interest as moral principle and I have no confidence that much will change especially noting their already declared open-ended timescale. So they will meet twice a year, with nice lunches, another year to report to the Council, another year to refine and implement … and this equals 3,200 more unanswered complaints. The RCVS is not fit for its purpose. It fails to regulate the profession; it appears to allow vested interest to influence the continued use of contested medicine and it seeks to ban the use of alternative treatments. We hope to be a part of changing this. I once had the pleasure of meeting a Native American Peace Warrior. He explained that every tribe has a peace warrior, and that their role is to mediate between tribal members who had fallen out with one-other. He said that it was his job to remain neutral and to listen to both parties to help them reach a mutually acceptable solution. However, he said, if one person is hurting many people, then it’s his job to take sides and make it clear that the offender’s behaviour is not to be tolerated. Many of us naturally assume that our government and its agents have taken on this role. The Veterinary Medicines Directorate, for example, claims that it ensures the safety and efficacy of veterinary medicines, but the opposite seems (to me at least) to be the case. If I’m correct in my conclusions, the VMD is there to help Big Pharma get its drugs, chemicals and biologics to market and ignore and obscure the deathly consequences as much as possible. This leaves us and our animals totally unprotected against unscrupulous business practices which, in the case of medicines, threatens lives. The Royal College of Veterinary Surgeons (RCVS) also claims to adjudicate when clients have complaints about their vets – but if you read on you’ll see that the process is not even far from acceptable. It’s a joke. I wish we had peace warriors in our society, able to uncover who is speaking the truth, and who is betraying their fellow human beings by lying or distorting the truth for their own ends. But society is too large; there are too many faceless voices; it’s too complicated. I was recently asked if I would be interviewed for a film to support the campaign to get the RCVS to retract its position statement which, in effect, makes it very difficult for holistic and homeopathic vets to practice. The RCVS thinks that complementary and alternative medicines (CAM) are unproven, and that conventional drugs should be offered before any of the alternatives – and many of us would be horrified if forced to do this to our dogs. As it stands, it makes life very difficult for holistic or homeopathic vets. So I’ve been thinking about the issue a lot. And it’s complicated, because although it’s about a professional body throwing its weight around, it’s also about individual human beings who are behind the statement. Are they genuine, or is there a hidden agenda? We’ve perhaps all asked this question, because we’ve used many of the alternatives and actually seen miraculous effects, so it’s puzzling that they should claim they don’t work so vociferously. Unless you know me personally, you may not appreciate that I’m an empath and abhor confrontation, and I never want to hurt anyone. It hasn’t come naturally to me to take on the veterinary profession, the veterinary pharmaceutical industry, and the industry’s regulators (who always, it seems, side with Big Pharma). But I did see it as a case of these groups harming many animals by over-vaccinating, and since I love the animals and their owners, I was prepared to stand up and speak the truth on their behalf via CHC, by writing, and with my voice. Sometimes those of us who choose the alternatives and speak about it are accused of vet bashing, so by calling the RCVS out, then some people will think I’m … vet bashing. But the truth is I’ve never met a vet I couldn’t love. Vets are usually really nice people, and I wouldn’t want us or our animals to be without them. On the other hand, it seems to me that the RCVS has overstepped its boundaries in terms of wielding its power, and it and its members haven’t been listening to pet owners very much. With the RCVS statement, it appears to be even less willing to listen to us – because we use the alternatives over the conventional options for a reason, and they don’t seem to want to know why. I wanted to reflect all of this, and the considerations that follow, in the film that’s being made. At the same time, because I’ve had so many people contacting me over the years who’ve had a problem with the treatment they feel they’ve received from their vets, and who were unhappy with the response they’ve had via the RCVS complaints procedure, I thought that it was time to call for a veterinary ombudsman – whose role, ideally, would be to act as an independent Peace Warrior between warring parties. There is an imbalance between individual pet owners who don’t have a professional body to support them, and vets, who do have several professional bodies to support them (the RCVS, the BVA, and the BSAVA). With the RCVS statement on CAM, however, homeopathic and holistic vets are arguably pushed out of these clubs. So an independent ombudsman, if truly impartial, might bring peace to a situation where the power currently resides chiefly with one side. At the same time, I don’t want to start a war and state that all vets are scum-sucking bottom dwellers who need to be reprimanded – because there are, as you know, usually two sides to every argument. We’re just fools if we listen to only one side without also listening to the other. If you’ve ever had a job which entails dealing with the general public, then you’ll also know that the general public can be pretty unpleasant to deal with! So whilst calling for a veterinary ombudsman, and responding to the RCVS, I think we should look at the whole truth, and not just one side of the story. And I’m starting with ‘our’ side, we pet owners. If you’re a member of Canine Health Concern, I think it’s pretty safe to assume that you’re not an ordinary dog owner. It’s likely that you’re someone who will go an extra hundred miles or so (over broken glass) to do the best by your dogs. Rather than troll along to your vet and abdicate responsibility, you’ll take the time to research, read-up on alternatives, and even put the work in and do it the hard way when simpler options exist. This is because, even if the drugs and chemicals might do it with far less effort on your part, they all come with some pretty horrendous unwanted effects. To us, they’re last resort medicine. The Royal College of Veterinary Surgeons (RCVS), and your own local vet, may think differently. They may think that you’re some sort of sociopathic extremist who wants to feed ‘unsafe’ raw food, and who won’t use the drugs and chemicals they prescribe because of some faulty ideological beliefs. They think you’d happily see your dogs suffer rather than drop the dogma. Further, you’re not trained as they are. What do you know? No doubt vets do a lot of client bashing! But wouldn’t it be nice if they took the trouble to listen to what we know? Standing up to your vet who thinks you’re letting your dogs down by refusing their toxins is not easy, either. Not everyone is a great communicator; we might not under pressure be able to reel off the facts and figures to argue our point or, if we do, we may be frightened to speak out for fear of making the relationship with our vet even worse. And then there are the pet owners who have never grown up. I apologise in advance for saying this as I’m not sitting here looking for ways to offend people, but it’s clear that many pet owners don’t want to think for themselves, because this would mean taking responsibility for themselves and their own actions. Far better to not think at all and do as you’re told, which means you have someone else to blame if it all goes wrong. Another issue is that people can be very lazy. They want someone else to do the work for them. They don’t want to put themselves out. And it turns out that it’s easier to pour kibble into a bowl than it is to explore the options and do a little bit more work to provide natural and nutritious meals. For example, I started a Facebook group, flocked-to by grateful clients, to resist the RCVS statement and pressurise them into retracting it. There’s even a legal fund (that’s been started by the campaigning group rather than CHC, and all fully above board and legal) that’s managed to raise just over £7,000 of the £100,000 that’s needed to pay for legal fees and expenses over the last few months. However, if every person on this Facebook group had donated £10, the fund would now stand at £30,000. Why so few donations? Is freedom of healthcare choice for our animals not worth a measly £10? People on the Facebook group also had lots of ideas and plenty of enthusiasm, and lots of outrage. But despite the ideas, there were few volunteers willing to do any of the work to bring those ideas to fruition. It’s left, as usual, to a small body of people who put themselves out. I moved away from it. I’ve had enough of being Cinderella while everyone else gets to go to the ball. This isn’t to say that CHC hasn’t been helping; I’ve just moved away from the idle chatter. As Kahlil Gibran said in The Prophet, “the victim is never innocent of the crime”, which may be a bit harsh in some areas – but apathy is always (in my experience) a much bigger problem than the initial problem itself. I’ve known for a couple of decades that if dog owners opened their ears and eyes, and then acted on the science we shared, and even helped CHC out a little more, annual vaccination would have ended a very long time ago. We should at least respect the veterinary profession for spending five arduous years in college to qualify; for putting the work in. So there are some of us who do the work, and the rest of us who lie down. Having said that, there are also many of you who have helped, and you have no idea how seriously I take you for it. You at least won’t be offended by the radical truth in this newsletter. My feeling is that it really is time for the human race to grow up and stand up. Pointing the finger at vets is not enough; it’s not the whole story. If we don’t want to be infantilised by ‘those who know better than us’; if we don’t want to have our power, our freedom of choice, taken away, then we have to behave like adults and take responsibility through word and deed. We have to show up and be counted in a tangible way, rather than just sitting on our backsides pointing the finger at those we don’t approve of. The thing is, if you are weak and allow someone else to have authority over you, and that person abuses her position, then you get resentful and bitter, and then you go looking for revenge. Better to stand up for yourself in the first place, which effectively means growing up. On the positive front, there’s a huge movement in the dog world where people are taking responsibility for their own dogs at least. This is a big deal because saying no to drugs and chemicals can make life much harder and more complicated. Try dealing with fleas if you choose to avoid the chemicals that might kill your dogs. When the vet found a flea on George, she tried to persuade us to use the dangerous chemicals, especially as Georgie has a flea bite allergy. He was beside himself with itching. But we would never forgive ourselves if we went for the easy option and he suffered as a result, or even died. We had to go through a long process and do a lot of vacuuming and spraying with essential oils before we beat the little suckers. But it would have been so much easier if we could have given George a tablet or a spot-on. And I don’t think the vet is going to congratulate us for doing it the hard way. I think she’s going to close her ears to what we achieved and turn away. It’s also ‘easier’ to vaccinate and not have to worry about protecting our dogs another way. The worry is the hardest to bear, because we’ve been sold a lie. Dog owners have been told for decades that a trip to the vet every year, and an injection, removes any possibility that our dogs will die. That feeling of safety is wonderful. Except none of this is true. Nosodes are a little more complicated than a trip to the vet and a one-off annual needle. You don’t have to worry about building a strong immune system if you accept the chemicals and drugs, and feed kibble, because you’ve managed to sleep through the copious information we and others make available. You don’t have to make brave, courageous, decisions. You don’t have to be responsible. And as your dog ages, if you abdicate responsibility and close your eyes and ears to the side-effects, then NSAIDs, steroids and antibiotics offer splendid options … until your dog’s liver or kidneys fail, or he dies of heart failure, or responds with brain damage or leaky gut and all the immune-mediated implications leaky gut entails. Vets have had it easy with subservient clients for a long time, and dealing with people who no longer go cap in hand to be told what to do must be hard for them. I notice that doctors for humans are far more open to us using the alternatives these days, so the veterinary profession is lagging behind. But blaming vets for everything is too one-sided, and a peace warrior or ombudsman wouldn’t let you get away with that. He’d expect you to take responsibility for your choices, whilst ensuring you haven’t been bullied into anything. And now onto the veterinary profession. It’s difficult to understand how one group of vets can think that their peers, who have passed the same exams as them and who are therefore also vets – but vets who have chosen to go further and study homeopathy or acupuncture or nutrition or herbs – must be thick or stupid if they think that these modalities work. It’s difficult to understand how a small group of vets, who have managed to get themselves onto the RCVS committee, could imagine that they absolutely know that the alternatives don’t work when they haven’t themselves put the work in to understand those therapies or try them out. All they’ve done is cherry pick third party research and bigged themselves up by putting people who think differently down. I admit it: I cannot stand those people whose only means of having self-respect lies in denigrating other human beings. This, to me, appears to be where the RCVS is abusing its power and overstepping the line. Rude as I may appear, it’s my assessment that the whole problem is about little people with little minds whose egos want to believe that they’re above others. They don’t do the work, but criticise the people who DO do the work. Lessons from history have shown us, over and over again, that when those who have power over others seek to limit the personal choices of others, great evil follows. In Communist Russia and China, for example, nearly 200 million people were murdered by their newly-formed communist states because they didn’t think the same as the ruling elite! Even to complain that they weren’t happy with the way things were had them executed or marched off to the gulags. I appreciate that making such a comparison against the RCVS could go down very badly. However, because I’m pointing the finger at the veterinary profession, which some call ‘vet bashing’, I feel that it’s important to make the point that we are all human beings and all capable of getting life wrong. You included; me included. And vets are human beings just like us. They are worthy of our compassion and respect, just as our fellow dog owners are worthy of our (and the veterinary profession’s) compassion and respect. The word ‘respect’ means to pay attention to, to listen to. However, we all – as psychology professor Jordan Peterson says – have monsters lurking inside of us. And make no mistake, our task as human beings is to learn to manage our own inner monster so that we don’t randomly harm others. At the same time, we need to get wisdom and knowledge to protect ourselves from the other fella’s inner monster (and to protect ourselves from the other fella’s monster, we may have to let ours out to play)! Our task is not to try to change anyone else unless they’re harming others. Our task is to change ourselves so that WE are better people. It seems to me that the people who think they’re perfect, or superior, are the ones who are the least perfect and superior. It’s only by acknowledging our faults that we can strive to rid ourselves of them – and if you think you’re just fine as you are, then there’s no hope for you. This is precisely where the RCVS is going wrong: it’s trying to change others and legislate against others whilst doing absolutely nothing (and apparently not even recognising) the huge gaping holes in its own system of thinking and being. The conventional fraternity within the RCVS may think, though, that homeopathic vets are causing harm to animals by withholding the conventional drugs. If the RCVS is right, then the logical conclusion is that homeopathic vets must be psychopaths who don’t care if they’re causing harm. They must be carrying on being homeopaths or herbalists or nutritionists despite the fact that nothing is working! We don’t agree. It’s all very strange, because many of us have miraculous stories to share about our dogs who were helped by holistic vets, and even knowledgeable non-vets, when conventional medicine either harmed them or had nothing left to offer them. So many of us are using holistic and homeopathic vets and are exceedingly glad that we found them. And I don’t think we’re all stupid or gullible, either! It seems to me that if ‘the science’ doesn’t support homeopathy, and if ‘rigorous research’ doesn’t support homeopathy, then there’s something wrong with the science, and something wrong with the scientific model. Maybe it’s because ‘the science’ is still working from the old Newtonian paradigm, whereas the science to support the homeopathic model more likely lies in the realms of quantum physics! Quantum physics takes us above the material realm and into the realms of energy or frequency, which is essentially closer to the causal level. This isn’t weird New Age woo – it’s the cutting edge of science, and it’s leaving the drugs and chemicals and vaccines behind. Way behind. Maybe the vets and alleged scientists who oppose energy medicines are too darned lazy to re-train and get with the program? Or maybe they’re secret agents, working for Big Pharma to keep the profits rolling in? The problem is that we don’t know, because even if there were laws forcing these people to fess up if someone’s bankrolling them (which there aren’t), there are plenty of ways to hide the truth if you want to. I for one know that my dogs were dying at unacceptably young ages, and suffering from debilitating illnesses, when I was hooked into the conventional veterinary model. Since I learnt about homeopathy, herbs and nutrition – and ditched the drugs, vaccines and chemicals – my dogs have been much healthier, and have lived long and healthy lives. I’m sure many of you have the same story to tell. The RCVS clearly fails to understand why we are turning away from conventional medicine in droves, and why so many of us would rather see a homeopathic vet than submit our dogs to the unwanted consequences of conventional offerings. But it seems they haven’t even bothered to ask us why. A BBC study back in 2000 put the complementary and alternative market in the UK at £1.6 billion – and it’s been growing rapidly. The US CAM market is currently thought to be around $3 billion. Would these figures explain why the conventional medical gravy train – and Big Pharma and the scientists that make billions out of it – are seeking to silence the opposition? For if we can use frequencies to heal illnesses (which is what all energy medicine is essentially about), then there will be no need for the drugs and their side effects. Could this be why so many holistic doctors – who are onto something – have been apparently murdered in the United States? The figure is currently around 90 dead holistic doctors, and growing. You have to ask why the media is silent on this. It’s apparent to me that homeopathic vets spend most of their time trying to fix the suffering caused by the conventional medical model. With respect, since I first started Canine Health Concern to research the causes of illnesses in modern dogs, and through campaigning to end the over-vaccination of our dogs, I have come to the conclusion that the current scientific model and its ‘recognised evidence base’ is not only faulty, but dangerous. 1. The developer/manufacturer conducts its own safety and efficacy tests and presents its own data to the regulator, the VMD. The VMD appears to accept the manufacturer’s evidence at face value, notes the adverse effects, and then awards a license. 2. A datasheet is prepared, listing the copious warnings, contraindications, and adverse effects. The regulator actively accepts the carnage, and even calls unsafe products safe by the mere act of approving them whilst proclaiming itself to be ensuring the safety of these products. 3. Then, once it goes into the field, further adverse effects are noted. At this point the manufacturer invariably denies claims until eventually forced, by the weight of evidence some years later, and after many have suffered. 4. In notorious instances, dirty tricks are used by Big Pharma to prevent knowledge of serious side-effects from leaking out and reducing sales, and in known cases exerts pressure on the regulator to keep the product on the market. 5. When our dogs suffer adverse reactions, a small proportion of them are reported to the VMD. Because these adverse effects are vastly under-reported, we get a skewed view of the carnage. Where is the rigour in that? 6. A subset of Defra, the Veterinary Products Committee (VPC) sits as a committee and decides whether it was a drug/vaccine reaction or not. Unfortunately, many of the people on the VPC are in receipt of funding from the very companies whose products are in question. The fox has its cubs guarding the hen house, but we’re expected to trust them at face value. 7. Eventually, when enough adverse reactions are reported against a drug, chemical or biologic, the regulator has the product withdrawn. Except this seems not to happen very often. 8. Often our elected representatives, our MPs, act as paid consultants to the manufacturer and use their position to prevent the product from being withdrawn. 9. Scientists also get on the payroll and are paid to conduct skewed research or are even paid to get on the circuit to lecture about the wonders of such and such a product, despite its poor safety profile. 10. If you, your children, or your animals are harmed by one of these ‘rigorously tested’ products … tough. You and they are now numbers and statistics, and you’re unlikely to be compensated. Besides, what use is compensation if you’re dead? During 2017, warnings were issued in the BMJ about a NSAID for humans, namely Ibuprofen, due to the risk of cardiac arrest. Ibuprofen has been on the market for decades. How many people has it killed in the meantime, do you think? And do you think there are no safer alternatives? Well, there are … except the regulators seem to be in the business of suppressing their sales, or knowledge of them, by bullying the doctors and vets who might choose to use them. NSAIDs (COX2 inhibitors) are a favoured drug of choice for the conventional veterinary community. They’re in the same class as the infamous Vioxx for humans which caused thousands of human deaths and some pretty spectacular compensation figures, plus hefty fines were placed upon its manufacturer which actively hid the damage this drug was causing. Allegedly ‘rigorous science’, supplied to regulators by the same companies that manufacture and benefit financially from the products, informs us that NSAIDs can cause gastrointestinal, liver and kidney problems in dogs. Do vets warn their clients before prescribing them? After the NSAID Rimadyl was introduced in America, significant reports of sudden animal deaths surfaced. The FDA received more than 6,000 adverse reaction reports about the drug (manufactured by Pfizer). As a result, the FDA requested that Pfizer advise consumers in their advertising that death is a possible consequence. Pfizer initially refused; however, they now include death as a possible side effect on the drug label in America. Where is this information in UK datasheets? Where is the informed consent? Several million dogs received Rimadyl before its warning label was updated in America to add mention of death. The number two pain reliever Deramaxx was marketed for a year before its label was also changed. Metacam is also flagged in American datasheets as potentially causing death. Beware all NSAIDs, and actively look for alternatives if you don’t want to be complicit in your dog’s death. We have evidence from Dr Victoria Hampshire in America, and the senator who helped her, that she was removed from her position at the FDA because she took seriously the large body of adverse reactions reported by clients to ProHeart6, the heartworm preventative. Its manufacturer engaged the services of a PR firm and private investigators to try to discredit her and have the drug returned to the market. We only know about this because Dr Hampshire and Senator Grassley made this public. How does this sort of thing play itself out in the UK, in the face of powerful international corporations? And how does corporate lobbying affect our governments? There are also Facebook groups asking whether parasite control chemicals such as Bravecto, Nexgard, Comfortis, Simparica, Trifexis and others kill dogs. These groups were started after dog owners thought they did, and I know that some of the companies behind these products have issued threatening letters to the people who have asked these questions. Is it fair that corporations should seek to stop people even asking the questions? Is that an appropriate balance of power? As of February this year, there have been thousands of adverse event reports logged by the European Medicines Control Agency. Bravecto has caused 7,098 serious (reported) side-effects and 1,696 deaths. Nexgard has given rise to 11,275 acknowledged serious side-effects and 698 deaths. Simparica is acknowledged by the MCA to have caused 834 reported side-effects of a serious nature, and 118 deaths. But does your vet tell you that your dog might suffer serious harm and even die if you use these products? Do you think you should be told? Rigorous science also informs us that many of the flea control chemicals can have deathly consequences for humans, and pose a serious threat to the environment. But who acts on this deathly information on our behalf? Why does it take campaigning groups to bang their heads against ‘scientific’ brick walls to try to effect change, and why does the scientific system has its fingers in its ears and its hands over its eyes? It seems to me that homeopathic vets first came under fire from the conventional fraternity when I started asking questions about over-vaccination and vaccine damage back in the 90s, and several homeopathic vets supported me and CHC. We now know, beyond doubt, that there’s no need to vaccinate our dogs against the core diseases of distemper, parvo and hepatitis every year. We know that protection will potentially remain for life, from one successful shot (usually after a puppy reaches the age of 14 to 16 weeks). Even three-yearly vaccination is questionable. We also know, through CHC branch VacciCheck clinics, that many puppies who are raw fed and free from chemicals will naturally develop antibodies to these diseases without dying, and without risking the vaccine needle. But does this stop the veterinary profession from pushing annual shots for these diseases? Absolutely not – and their professional bodies, which might be expected to guide the profession in terms of ethics, does absolutely nothing to stop them. We know that leptospirosis is a rare disease in the UK, and those of us who are old enough, remember the times when lepto was known to be rare. We didn’t used to vaccinate against it every year because it wasn’t something our vets worried about particularly. Many of us know vets who have told us in the past that they hadn’t seen a case of lepto for at least ten years. However, now that many of us know we don’t need to vaccinate against the core diseases annually, suddenly the lepto threat is being magnified and scaremongering is the norm. We also know – because pet owners have done the research the veterinary profession should have done – that kennel cough vaccines are a public health hazard! We know that the vaccine causes kennel cough in dogs, and that recently-vaccinated dogs can cause outbreaks in kennels. We know that this vaccine prevents long-term immunity, whereas natural infection confers natural immunity. And we know that the up-the-nose kennel cough vaccine can cause a whooping-cough-like illness in humans, as well as other serious health conditions. We also know that there is a steady and growing stream of research to show that vaccines cause brain damage, autoimmune diseases, and allergies – which I consider to be the REAL epidemic in the modern dog. Do vets seek out this research, or even listen to those of us who seek to share it for the sake of our dogs? It seems not. Where is the informed consent? Veterinarians take it upon themselves to refrain from informing clients of the unwanted potentials. Where are the datasheets to accompany many of the drugs and vaccines prescribed for our pets? Are they given to clients? I think not. This is short-termism, because when our animals are killed by such products, we lose trust in the veterinary model, start asking questions, seriously want our veterinarians to offer us INFORMED CONSENT, and start to move away from the dangers. You see, arrogant ‘scientists’ at the RCVS believe they have the allegedly rigorous science on their side, but it works only if we – the consumers – accept the concept of sacrifice. That is, to use conventional drugs, chemicals and vaccines, we have to accept (often in retrospect) that our dogs might die as a result of using them. Our animals are family. They are not numbers to be dismissed when they suffer the unwanted consequences of products the veterinary profession prescribes. And certainly not if there is a safer natural product that will do the job without potentially killing our pets. The RCVS’s sneering (apologies for consciously using that word, but what a sneerer he is) Mr Danny Chambers thinks that there’s no evidence to support the use of alternatives – but those of us who use them and do the research know he’s talking out of his bias. Practising homeopathic vets also know that there is an air of witch-hunting where complementary and alternative therapies are concerned. Young, newly qualified, vets know that if they get involved with a holistic practice, then their chances of employment in a conventional practice in the future is seriously compromised. Being interested in another way is, it seems, professional suicide. That’s not science – it’s a mindset that censors the open pursuit of knowledge. A fiduciary is a person who holds a legal or ethical relationship of trust with others – such as a vet, government agent, or a professional body. In English Common Law, it is incumbent upon all of us to know stuff that we ought to know. For example, a CEO cannot pretend innocence if he knows the company secretary is cooking the books. Not acting upon known information is a crime. A veterinary surgeon and his professional bodies ought to know, for example, that vaccines are not totally benign. There is copious scientific research to illustrate this FACT. A vet should have a moral and professional obligation to report this to clients – but the RCVS leaves all of this up to individual vets, who don’t tell us these things. A veterinary surgeon also ought to know that our dogs don’t need to be vaccinated every year for the core diseases, and they ought to know the flip side of annual vaccination against leptospirosis and kennel cough. But they act like the three little monkeys, with their hands firmly over their eyes and ears. The RCVS, and other veterinary professional bodies, have done a Pontius Pilate on us and our pets – totally washing their hands of the actual science and leaving it up to individual vets to sell vaccines at their own discretion, whilst withholding duration of immunity and adverse effect information from clients. Yet we’re expected to trust the ‘professionals’ we hand our money over to, rather than be respected as caring pet owners who are doing the work and the research that vets either don’t do, or don’t want to know about. If the RCVS were to open its eyes, it would be vastly enriched. There is no way veterinary surgeons can honour the oath to first do no harm when it has only toxic products and very little else to offer. I thank God for the holistic vets who offered me a different way – for if I had to do it the conventional way again, I couldn’t possibly bear the pain of dog ownership. “Two years ago I found that our prescription drugs are the third leading cause of death, after heart disease and cancer. Our drugs kill around 200,000 people in America every year, and half of these people die while they do what their doctors told them. So they die because of the side-effects; the other half die because of errors. And it’s often the doctors who make the errors, because any drug comes with maybe 20, 30 or 40 warnings, contraindications, precautions and so on. No doctor in the world knows about all this. “ … The other thing I found out was that much of what the drug industry does fulfils the criteria of organised crime in US law. And they behave in many ways like the Mafia does. They corrupt everyone they can corrupt. They have bought every type of person, even including ministers of health in some countries. There is a huge amount of corruption. “ … Drugs are not that helpful. They kill very many of us. What we need to do in the coming years is to take far fewer drugs than we do currently. If we did that and were careful, then we could live longer and better lives. “ … it’s not popular to tell the truth in healthcare. You will get a lot of enemies, because a lot of people make money on false premises, doctors and industry alike. And our drug regulators and our politicians, they are on board on this wagon. Very few people are independent of money in healthcare. Last week I was invited to go on Good Morning Britain (GMB), an ITV breakfast show in the UK. 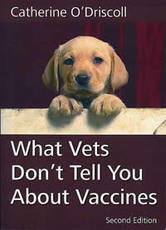 I am the author of two best-selling books on the science of vaccine damage in our companion animals, namely What Vets Don’t Tell You About Vaccines, and Shock to the System. I have been running Canine Health Concern, a non-profit organisation, since 1994. CHC’s aims are to share information about the causes of health and ill health in the modern dog in order to help owners raise long-lived healthy dogs. The show has been re-scheduled several times, and now it has been ‘postponed’. * It’s so important to have pets vaccinated, especially puppies in the first year, it’s like the measles debate. It’s fair to other pet owners – we don’t want lots of dogs/puppies dying from preventable diseases. These illness are fatal and this can be prevented. * Parvovirus is truly horrible – outbreaks of diseases, dogs getting ill very easily. Parvo stays around for a long time, so your dog would just need to be out for a walk. *You won’t see many dogs with Distemper now because it’s been almost totally eradicated because of vaccines, it used to be very common. It’s a horrible disease, cough, runny eyes, nose, fever, won’t eat, get pneumonia, fits & muscle convulsions. Very high mortality rate. It just takes a few people to stop vaccinating. It’s so dangerous. * Never seen reactions to vaccines in over 50 years. * We seen human trends and medi al breakthroughs moving into vetinary medine such as extended life care and end of life treatment for poorly pets but this is something that really isn’t helpful. * The idea of autism in dogs doesn’t stand up to scientific scrutiny. Prior to receiving a call and email from Emma Creamer, I had received several calls from Nicolette Amet, another researcher on the programme. She wanted to know how I’d answer the above points from David Grant (which I hadn’t at this stage seen; she talked me through it), and the Guardian piece, so I gave my responses verbally. I would like to emphasise that all the researchers were very pleasant and I judged them to be genuine and keen to get a balanced story. I told Nicolette that I don’t vaccinate my dogs and haven’t vaccinated for the past 25 years. None of my dogs has died of vaccine-preventable diseases, but they have died from vaccine-associated diseases. * Oliver died aged four of encephalitis (inflammation of the brain with lesions throughout the brain and central nervous system. A symptom of encephalitis is called paresis, which means paralysis of one or more limbs). Oliver’s back legs were paralysed when we woke up on the morning of 1st September 1991, and he was dead by 4pm. Encephalitis is an acknowledged vaccine reaction. This happened within three months of a vaccine event. * Samson, who died of cancer aged five. He had paralysed rear legs after his second puppy shot. After his first and only booster, Samson’s head swelled up like a football and he ran around the house screaming all night. By the age of two he was diagnosed with autoimmune disease, and cancer saw him off. All of these conditions are acknowledged to be potentially vaccine-induced. See references later. I choose not to vaccinate because I consider vaccines to be more dangerous than the diseases we vaccinate against. Vaccines are known to cause autoimmune diseases, cancer, leukaemia, allergies and brain damage. This is the REAL epidemic in the modern dog: vaccine-induced immune-mediated and inflammatory diseases. I will not risk vaccines. Since I stopped vaccinating my dogs, I have had the joy of living with long-lived, healthy dogs. Since I stopped vaccinating and started feeding real food 25 years ago, I have had Golden Retrievers living to the ages of 17 (Chappie and Sophie) and 16 (Gwinnie). Edward and Daniel lived to 13 and their vet bills amounted to only £10 per year. They were never ill. Golden Retrievers typically die between the ages of eight and 12. I emphasised to the researchers when asked that I wouldn’t encourage others not to vaccinate, unless they do it properly and give their dogs alternative protection. I told them about research showing that nutrition is the primary defence against infection and cited studies, including a WHO study, which showed that various vitamins and minerals are anti-infective, including vitamin A, vitamin C, vitamin D, zinc, and selenium. I told her that I also use anti-viral and anti-bacterial herbs for my dogs. I could understand why this man would want us to vaccinate all of our dogs. But I also wanted to share research to explain to him why many of us choose not to, and what we are doing instead to protect our dogs. Canine Health Concern branches around the UK also hold VacciCheck clinics, where antibodies are measured so owners can be sure their dogs are protected. In our Cornwall branch, for example, all but two dogs show circulating antibodies to distemper and parvo – even the three-month-old UNVACCINATED puppies. 1. CJ Duncan, et al, The effects of population density and malnutrition on the dynamics of whooping cough. Epidemiol Infect. Oct 1998; 121(2): 325–334. I said that if people were going to feed kibble, which is cooked at high temperature and extruded (the moisture is sucked out), then their dogs wouldn’t be receiving the nutrients they need to fight infection, and not vaccinating wasn’t a good option. Unfortunately, without adequate nutrients, these dogs would also be more at risk of a vaccine reaction, since poor nutrition will compromise the immune system (as stated in veterinary vaccine datasheets). MLV vaccines might actually be the reason why outbreaks occur in vaccinated kennel/rescue environments. They cause immunosuppression (meaning dogs going into the shelter environment may be sitting ducks for disease because the vaccine temporarily nobbles their immune system). Also, MLV vaccines can revert to virulence (they can start outbreaks). There is another virus in canine vaccines in the UK. It’s a retrovirus called RD-114. News of this was published in 2010, (Isolation of an Infectious Endogenous Retrovirus in a Proportion of Live Attenuated Vaccines for Pets, Journal of Virology, April 2010, p. 3690-3694, Vol. 84, No. 7. http://jvi.asm.org/cgi/content/full/84/7/3690) (see also Applied Biosafety, 9(2) pp. 68-75 © ABSA 2004, Introduction for “Safety Considerations for Retroviral Vectors: A Short Review”, Donald E. Mosier). After learning of RD-114 contamination in several un-named brands of distemper vaccine in the UK and Japan, I contacted the UK’s regulator, the Veterinary Medicines Directorate, immediately, to ask what it was going to do about this problem. The VMD called a meeting with the European Medicines Control Agency. They decided to just leave it there for now. I’m advised that it wouldn’t be difficult to screen RD-114 out, but it would be difficult and time-consuming to licence a clean product, which would leave manufacturers without revenue for a few years. Each time I spoke to each of the researchers, I took great pains to say that the real problem is that vets are over-vaccinating our dogs, and that vaccines can cause harm. The World Small Animal Veterinary Association has stated this many times. In their puppy vaccine summary they said: “any reaction to a vaccine that is not needed is unacceptable”. The WSAVA says that we should vaccinate against the core diseases of parvovirus, distemper and canine infectious hepatitis no more than every three years, but that immunity to these viruses is likely to be lifelong. The add: “This is often taken to mean that we should vaccinate every three years – but this is not the case. If the dog is already immune to these three core diseases, re-vaccinating will not add any extra immunity”. This does not stop our vets. As far as I can see, at least half of the UK’s veterinary practices vaccinate annually – unnecessarily – or every three years (which is also too much). The professional veterinary bodies leave vaccine protocols up to individual vets. There is no-one in the UK seeking to reduce the vaccine load on our companion animals. Except the pet owners who are doing the research that vets should be doing. Each year, MSD has a ‘Vaccine Amnesty’ sales and marketing drive in which they, through vets, offer a full puppy or kitten series for the price of a booster. There is absolutely no science to support giving adult dogs a series of shots. A series is given to puppies and kittens to try to find the earliest time when maternal immunity wanes (maternal immunity will block the vaccine virus as if it is a natural infection, so the vaccine can’t provoke immunity). This does not apply to adult animals. It’s a BOGOF sales campaign that is totally unsupported by the science. Dr Ron Schultz of the World Small Animal Veterinary Association Vaccine Guidelines Group warns that this is unnecessary and potentially harmful. None of the professional bodies have done anything about this. The heading reads: “Dogs cannot get autism British Veterinary Association warns after ‘anti-vaxx’ movement spreads to pets”. The “anti-vaxx” movement (which is what the vaccine industry and its allies likes to call those of us whose pets and children have suffered vaccine reactions and who have the audacity to do the research and actually talk about it), ‘spread to pets’ when vaccines first started harming and killing our dogs, which would be soon after vaccines were introduced for dogs many decades ago. This is because all vaccines come with inherent risks. This is why the human vaccine industry benefits from indemnity against vaccine damage via their governments. Vaccine damage has a special legal class of its own. Vaccine damage compensation schemes exist around the world. The point, however, is that those of us who seriously question pet vaccines – especially in view of their over-use – should be allowed to ask questions and share the known research without being called names by the profession that professes to care about our pets. Further, we do not have the research to rely on which would enable us to major on the autism debate, so we’re not always harking on about autism in dogs, although questions have been asked by pet owners and vets alike. What we would like, however, is the veterinary industry to look at the existing research which clearly shows that vaccines cause autoimmune diseases, allergies, cancer and brain damage. I felt that by choosing to push the show towards discussion of autism in dogs, Good Morning Britain was in danger of missing the point. Although autism in dogs is not proven (which is not to say that it isn’t possible), vaccines can and do cause autoimmunity, allergies, cancer and brain damage. Possible adverse events include failure to immunize, anaphylaxis, immunosuppression, autoimmune disorders, transient infections, and/or long-term infected carrier states. In addition, a causal association in cats between injection sites and the subsequent development of a malignant tumor is the subject of ongoing research. 6. “Live attenuated rubella vaccine inoculation may cause sustained immunosuppression including defective lymphocyte response to mitogene and impaired cytokine production. The signs of immunosuppression may persist for at least 1 month after vaccination”. (Cytokine profile after rubella vaccine inoculation: evidence of the immunosuppressive effect of vaccination, Mediators of Inflammation, 12(4), 203-207 (August 2003)). 7. Cancer Research 30, October 1970, ‘Spontaneous Development of Mammary Adenocarcinoma following Prolonged Immunosuppression in the Dog’: “Live attenuated rubella vaccine inoculation may cause sustained immunosuppression including defective lymphocyte response to mitogene and impaired cytokine production. The signs of immunosuppression may persist for at least 1 month after vaccination”. 11. Hershey A, Dubielzig R, Padilla M, Helfand S (2005). “Aberrant p53 expression in feline vaccine-associated sarcomas and correlation with prognosis”. Vet Pathol 42 (6): 805–11. doi:10.1354/vp.42-6-805. 12. “Vaccine-Associated Feline Sarcoma Task Force: Roundtable Discussion”. Journal of the American Veterinary Medical Association 226 (11). 2005. http://www.avma.org/journals/javma/articles_public/vafstf_050601.asp. 13. Hendrick M, Goldschmidt M (1991). “Do injection site reactions induce fibrosarcomas in cats?”. J Am Vet Med Assoc 199 (8): 968. 14. Kitchell, Barbara E. (2005). “Feline Vaccine-Associated Sarcomas”. Proceedings of the 30th World Congress of the World Small Animal Veterinary Association. 15. Richards J, Elston T, Ford R, Gaskell R, Hartmann K, Hurley K, Lappin M, Levy J, Rodan I, Scherk M, Schultz R, Sparkes A (2006). “The 2006 American Association of Feline Practitioners Feline Vaccine Advisory Panel report”. J Am Vet Med Assoc 229 (9): 1405–41. 16. Munday J, Stedman N, Richey L (2003). “Histology and immunohistochemistry of seven ferret vaccination-site fibrosarcomas”. Vet Pathol 40 (3): 288–93. 17. O’Rourke, Kate (2004). “Researchers probe vaccine-associated feline sarcoma”. Journal of the American Veterinary Medical Association 225 (6). http://www.avma.org/onlnews/javma/sep04/040915k.asp. 18. Hershey A, Sorenmo K, Hendrick M, Shofer F, Vail D (2000). “Prognosis for presumed feline vaccine-associated sarcoma after excision: 61 cases (1986-1996)”. J Am Vet Med Assoc 216 (1): 58–61. doi:10.2460/javma.2000.216.58. 19. Martin M (2003). “Vaccine-associated fibrosarcoma in a cat”. Can Vet J 44 (8): 660–3. 20. Chang H, Ho S, Lo H, Tu Y, Jeng C, Liu C, Wang F, Pang V (2006). “Vaccineassociated rhabdomyosarcoma with spinal epidural invasion and pulmonary metastasis in a cat”. Vet Pathol 43 (1): 55–8. doi:10.1354/vp.43-1-55. 21. Couto S, Griffey S, Duarte P, Madewell B (2002). “Feline vaccine-associated fibrosarcoma: morphologic distinctions”. Vet Pathol 39 (1): 33–41. doi:10.1354/vp.391-33. 22. Eigner, Diane R.. “Feline Vaccine Guidelines”. The Winn Feline Foundation. http://www.winnfelinehealth.org/health/vaccination-guidelines.html#recommendations. 23. Lappin, Michael R. (2004). “Feline vaccines”. Proceedings of the 29th World Congress of the World Small Animal Veterinary Association. 24. Kass P, Spangler W, Hendrick M, McGill L, Esplin D, Lester S, Slater M, Meyer E, Boucher F, Peters E, Gobar G, Htoo T, Decile K (2003). “Multicenter case-control study of risk factors associated with development of vaccine-associated sarcomas in cats”. J Am Vet Med Assoc 223 (9): 1283–92. doi:10.2460/javma.2003.223.1283. 26. Smith, G.R. and S. Missailidis, Learning from cancer: The adaptive growth, wound and immune responses. Gene Therapy and Molecular Biology, 2009. 13(A): p. 158-185. 27. Rassnick KM: Feline vaccine-associated sarcomas: The problem is not over yet. Proceedings ACVIM Forum 2006. 28. Shaw SC, Kent MS, Gordon IK, et al. Temporal changes in characteristics of injection-site sarcomas in cats: 392 cases. (1990-2006). J Am Vet Med Assoc. 2009 Feb 1;234(3):376-80. 1. “There is a real concern that vaccines may predispose certain genetically susceptible individuals to immune-mediated disease. The more antigens we administer, the higher the potential for hypersensitivity. Type I is IgE mediated; type 2, cytotoxic antibody mediated; type 3, immune-complex mediated; and type 4 cellular mediated. All of these hypersensitivities are natural parts of the immune response, but they cause a certain amount of tissue damage. That damage may occur in the kidney, liver, or as was the case with canine adenovirus 1, in the eye. In many cases it is impossible to show a direct connection between the damage and a vaccine, since it is the accumulation of many antigens over many years that results in clinically evident disease.” JAVMA, Vol 207, No 4, August 15, 1995 – Current Concepts, are we vaccinating too much? 3. In Practice, Vol 20 No 2, Feb 1998: Michael Day, senior lecturer in Veterinary Pathology at the University of Bristol states that “environmental influences are crucial to the expression of immune mediated disease and that the most important of these is likely to be exposure to microbial antigens following natural infection or vaccination. Mr Day divides immune mediated disease into four main groups – hypersensitivity diseases, autoimmune diseases, immune system neoplasia [tumour formation] and immunodeficiency diseases”. 5. McAnulty JF, Rudd RG: Thrombocytopenia associated with vaccination of a dog with modified-live paramyxovirus vaccine. J Am Vet Med Assoc 1985 186:1217-1219. 6. Duval D, Giger U. Vaccine-associated immune-mediated hemolytic anemia in the dog. J Vet Int Med 1996; 10: 290-295. 7. In 2000, research showed that polyarthritis and other diseases like amyloidosis in dogs were linked to combined MLV vaccines (Am Coll Vet Intern Med, 2000; 14: 381). 10. Dr Ronald Schultz, Vet Med Today (JAVMA Vol 207, No 4, August 15, 1995): “Immunemediated disease has developed in human beings following vaccination, as was seen with cases of Guillain-Barre syndrome following swine flu vaccinations, and rheumatoid arthritis following influenza vaccination”. 11. Med Hypotheses, Waisbren BA Sr, 2008;70(2):346-8. Epub 2007 Jul 13. Acquired autoimmunity after viral vaccination is caused by molecular mimicry and antigen complimentarity in the presence of an immunologic adjuvant and specific HLA patterns. 12. The Journal of Veterinary Internal Medicine, Vol 10, No 5 (September October) 1996, ‘Vaccine Associated Immune Mediated Haemolytic Anaemia (IMHA) in the Dog’. 13. Negina IuP, Comparative study of auto-antibody formation following immunization with different types of vaccines. ZH Mikrobiol Epidemiol Immunobiol 1980 May; (5): 6972. 14. Romanov, UA et al, Role of auto-immune processes in the pathogenesis of post vaccinal lesions of the nervous system. ZH Mikrobiol Epidemiol Immunobiol 1977 Oct; 10: 80-93. 15. Ravel G, Christ M, Horand F, Descotes J, 2004, Autoimmunity, environmental exposure and vaccination: is there a link? , Toxicology, 196(3) : 211-6, Mar 15. 18. Fournie, G.J. ; Mas, M.; Cautain, B.; Savignac, M.; Subra, J.F. ; Pelletier, L.; Saoudi, A.; Lagrange, D.; Calise, M.; Druet, P. Induction of autoimmunity through bystander effects. Lessons from immunological disorders induced by heavy metals. J Autoimmun. 2001, 16, 319-326. 20. Israeli, E.; Agmon-Levin, N.; Blank, M.; Shoenfeld, Y. Adjuvants and autoimmunity. Lupus. 2009, 18(13), 1217-1225. 21. Exley, C.; Swarbrick, L.; Gherardi, R.K.; Authier, F.J. A role for the body burden of aluminium in vaccine-associated macrophagic myofasciitis and chronic fatigue syndrome. Med Hypotheses. 2009, 72(2), 135-139. 22. Lappin MR, et al: Investigation of the induction of antibodies against Crandall-Ress feline kidney cell lysates and feline renal cell lysates after parenteral administration of vaccines against feline viral rhinotracheitis, calicivirus and panleukopenia in cats. Am J Vet Res 2005 66: 506-511. 23. Strasser A et al: Immune modulation following immunization with polyvalent vaccines in dogs. Vet Immunol Immunopathol 2003 94:113-121. 1. Frick OL, Brooks DL. Immunoglobulin E antibodies to pollens augmented in dogs by virus vaccines. Am J Vet Res 44: 440, 1981. 12. In Pediatr Allergy Immunol 1994 May;5(2):118-23, the role of aluminium for IgG and IgE responses to pertussis toxin, as well as side effects, was investigated in 49 children with known atopy status. The addition of aluminium to pertussis vaccine was associated with strong IgG antibody response, and a stronger IgE antibody response. The study concluded that the role of immunization in the development of allergy merits further studies. 13. http://www.ncbi.nlm.nih.gov/pmc/articles/PMC2998561/ looks at the role of IgE antibodies in atopic dermatitis and refers to post-vaccination specific IgE responses to tetanus and diphtheria toxoid, which could result in adverse events to future vaccination or exposure to the diseases. 17. Cribbs, D.H.; Ghochikyan, A.; Vasilevko, V.; Tran, M.; Petrushina, I.; Sadzikava, N.; Babikyan, D.; Kesslak, P.; Kieber-Emmons, T.; Cotman, C.W. ; Agadjanyan, M.G. Adjuvant-dependent modulation of Th1 and Th2 responses to immunization with beta-amyloid. Int Immunol. 2003, 15(4), 505-514. 18. Shoenfeld, Y.; Agmon-Levin, N. ‘ASIA’ – Autoimmune/inflammatory syndrome induced by adjuvants. J Autoimmun. 2011, 36(1), 4-8. 19. Israeli, E.; Agmon-Levin, N.; Blank, M.; Shoenfeld, Y. Adjuvants and autoimmunity. Lupus. 2009, 18(13), 1217-1225. 20. Exley, C.; Swarbrick, L.; Gherardi, R.K.; Authier, F.J. A role for the body burden of aluminium in vaccine-associated macrophagic myofasciitis and chronic fatigue syndrome. Med Hypotheses. 2009, 72(2), 135-139. 21. Walton, J.R. A longitudinal study of rats chronically exposed to aluminum at human dietary levels. Neurosci Lett. 2007, 412(1), 29-33. 22. Ohmori K et al: IgE reactivity to vaccine components in dogs that developed immediate-type allergic reactions after vaccination. Vet Immunol Immunopathol 2005 104:249-256. 23. Vitale CB, Gross TL, Magro CM: Vaccine-induced ischemic dermatopathy in the dog. Vet Dermatol 1999 10:131-142. 1. Encephalitis has been shown to appear in dogs after vaccination. (Grene, CE, ed, Appel MJ, Canine Distemper in Infectious Diseases of the Dog and Cat, 2nd edition, Philadelphia: WB Saunders, 1998: 9-22). 2. Veterinary Record 1992 (130, 27-30), AIP McCandlish et al: “Post-vaccinal encephalitis is a recognised complication of the administration of certain strains of live attenuated canine distemper vaccine (Hartley 1974, Bestetti and others 1978, Cornwell and others 1988)”. 5. Wilson RB, Holladay JA, Cave JS: A Neurologic Syndrome Associated with Use of a Canine Coronavirus-Parvovirus Vaccine in a Dog. Compend Contin Educ Pract Vet. February 1986; 8(2):117-124. 16. Ballerini, Rico B et al., Neurological Complications of Vaccination With Special Reference to Epileptic Syndrome Riview Neurol, Jul-Aug 1973; 43: 254-258. 18. Perl, D.P. ; Moalem, S. Aluminum and Alzheimer’s disease, a personal perspective after 25 years. J Alzheimers Dis. 2006, 9(3 Suppl), 291-300. 19. Wisniewski, H.M.; Sturman, J.A. ; Shek, J.W. Chronic model of neurofibrillary changes induced in mature rabbits by metallic aluminum. Neurobiol Aging. 1982, 3(1), 11-22. 20. Pendlebury, W.W.; Beal, M.F. ; Kowall, N.W. ; Solomon, P.R. Neuropathologic, neurochemical and immunocytochemical characteristics of aluminium. Neurology. 2008 May 6; 70(19):1672-7. 1. Petit, T.L. ; Biederman, G.B. ; McMullen, P.A. Neurofibrillary degeneration, dendritic dying back, and learning-memory deficits after aluminium administration: implications for brain aging. Exp Neurol. 1980, 67(1), 152-162. 22. Petrik, M.S. ; Wong, M.C. ; Tabata, R.C. ; Garry, R.F. ; Shaw, C.A. Aluminum adjuvant linked to Gulf War illness induces motor neuron death in mice. Neuromolecular Med. 2007, 9(1), 83-100. 23. Gherardi, R.K.; Coquet, M.; Cherin, P.; Belec, L.; Moretto, P.; Dreyfus, P.A. ; Pellissier, J.F. ; Chariot, P.; Authier, F.J. Macrophagic myofasciitis lesions assess long-term persistence of vaccine-derived aluminium hydroxide in muscle. Brain. 2001, 124(Pt 9), 1821-1831. 24. Shaw, C.A. ; Petrik, M.S. Aluminum hydroxide injections lead to motor deficits and motor neuron degeneration. J Inorg Biochem. 2009, 103(11), 1555-1562. 25. Walton, J.R.; Wang, M.X. APP expression, distribution and accumulation are altered by aluminum in a rodent model for Alzheimer’s disease. J Inorg Biochem. 2009, 103(11), 1548-1554. 26. Golub, M.S. ; Gershwin, M.E. ; Donald, J.M. ; Negri, S.; Keen, C.L. Maternal and developmental toxicity of chronic aluminum exposure in mice. Fundam Appl Toxicol. 1987, 8(3), 346-357. 27. Redhead, K.; Quinlan, G.J. ; Das, R.G. ; Gutteridge, J.M. Aluminium adjuvanted vaccines transiently increase aluminium levels in murine brain tissue. Pharmacol Toxicol. 1992, 70(4), 278-280. 28. Struys-Ponsar, C.; Guillard, O.; van den Bosch de Aguilar, P. Effects of aluminum exposure on glutamate metabolism: a possible explanation for its toxicity. Exp Neurol. 2000, 163(1), 157-164. 29. Cohly, H.H. ; Panja, A. Immunological findings in autism. Int Rev Neurobiol.2005, 71, 317-341. 30. Banks, W.A. ; Kastin, A.J. Aluminum-induced neurotoxicity: alterations in membrane function at the blood-brain barrier. Neurosci Biobehav Rev. 1989, 13(1), 47-53. 32. Department of Paediatrics, Tokyo Medical University, Japan, found the measles virus in patients with inflammatory bowel disease and autism. (Dig Dis Sci, 2000, Apri; 45(4) 7239) . The sequences obtained from the patients with ulcerative colitis and children with autism were consistent with vaccine strains. It should be remembered that the measles virus and canine distemper are very closely related. I printed off the above research and references, ready to hand to the vet appearing on the show. It was a refreshing opportunity to meet a vet in public (or in private for that matter) to share the known science. Maybe he’d even look at it? I was contacted by three GMB researchers in all, and each time was asked to repeat how I would respond to assertions made by David Grant. The programmes slant moved on. Now they wanted to talk about autism in dogs rather than those of us who choose not to vaccinate. The show doggedly tried to have the programme centred around whether or not dogs get autism. They asked me to find a dog owner who would bring their allegedly autistic dog onto the show. They wanted me to bring my rescue Papillon, George, who shows autistic behaviours. I told the researcher that it would be unfair to bring him from Scotland to London for this. But I did put out messages on Facebook in case there was someone in London who thought their dog had become autistic post vaccination. No-one came forward. The show put its own request out. I also told the researcher that there is no research to prove that dogs can be made autistic by their vaccines and that I would not argue this point. Autism wasn’t something alleged ‘anti-vaxxers’ in the dog world had ever made much of. We have far more science to support the assertions of autoimmunity, allergies, cancer and brain damage. Nor was I willing to fly from Scotland to London if this is what the show was to be about. I did, however, tell the researcher that it’s acknowledged that vaccines can cause encephalitis, which means inflammation of the brain with lesions throughout the brain and central nervous system. Therefore vaccines can cause brain damage which can arguably alter behaviour. I emphasised to the researchers that whether or not dogs get autism from their vaccines, the real issue is that vets are over-vaccinating dogs, and that vaccines can cause harm. I referred to World Small Animal Veterinary Association (WSAVA) Guidelines which make it clear that once dogs are immune to the core viral diseases, they remain immune for many years and probably for life. I told them that there is copious research to support my claims, and that I looked forward to meeting Mr Grant to share this research with him. The show was scheduled to air on Wednesday, 25th May. Then it was postponed to air on Thursday the 26th, and again to Friday the 27th. Meanwhile Mr Grant had backed out of the show; I’m told it was due to either his own illness or the illness of a family member. I was aware of his withdrawal by Wednesday and they were trying to get a vet to replace him, unsuccessfully, it seems. By Thursday, the day before I was due (again) to fly down from Scotland to London, there was still no vet willing to defend the indefensible. By Friday the show was cancelled. Apparently ‘they’ wanted to wait until June, when the PDSA was scheduled to release some research. 1. Even vaccinated dogs can contract viral and bacterial diseases if their immune systems are not functioning normally. This can be caused by diet and stress, amongst other factors. 2. Dogs don’t need to be vaccinated to develop immunity. In CHC branch VacciCheck clinics, overseen by properly qualified vets, all but two dogs – vaccinated and unvaccinated, and even unvaccinated three-month-old puppies – show titers to the three core diseases. Only two dogs don’t have measurable antibody BUT this doesn’t mean the dogs don’t have protection in memory. What I would like NOW is for the professional veterinary bodies to stop releasing spurious press releases based upon misinformation, and answer pet owners’ legitimate concerns. The veterinary profession has been suffering from Vaccine-Associated Ostrich Disease for decades. It is over-vaccinating our pets and individual vets claim they have never seen a vaccine reaction. The problem is, they wouldn’t know a vaccine reaction if it slapped them in the face. As Ron Schultz says, ‘vets are not trained in vaccinology and are therefore not qualified to advise on vaccination’. LOOK AT THE SCIENCE, PLEASE. * As a final remark, it’s about time that individuals, professional bodies and charities which concern themselves with healthcare were made by law to make it visible and transparent if they are receiving funding from Big Pharma.